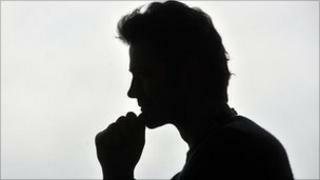 A campaign group says male victims of domestic violence in Cornwall are being left isolated. Esteem, a Truro-based group, said around 200 men in the county had been helped in the last two years but the nearest refuge bed is in Somerset. It is thought one in six men will suffer domestic abuse in their lifetime. Andrew Baker, from Esteem, said he could put up to four men a month in a refuge if they had the resources. One victim from Cornwall, who wanted to remain anonymous, said: "I think it's difficult for anyone to understand that men can be abused. "It just seems that it's overlooked and when you're being constantly abused and falsely accused of various things, it's difficult to know where to turn." Andrew Baker from Esteem, a Truro-based organisation which helps men who have been victims of domestic abuse, said: "It's a significant problem. I have been running this project for two-and-half-years. "I expected to see about 40 or 50 men. In the first two years I saw 160 men, to date it's been 200. Every story is different but each one is equally shocking." Cornwall Council gives funding for one independent domestic violence advisor who works specifically with male victims. Esteem itself is funded by the Big Lottery. Mr Baker is calling for more support locally, adding: "I would say about four men every month, I could put it into a refuge. They don't always get the same level of support as women. "There are 7,500 refuge beds for women in the country. There are ten dedicated refuge beds in the country for men. Yet one in three victims are male." Cornwall Council says the funding they have has to be prioritised for victims at risk of "immediate death" - and most times this will be a woman rather than a man. Michelle Davies, the council's domestic violence co-ordinator, said: "It's incredibly difficult. The comprehensive spending review reduced our funding by 30%. As a result we have to assess 'risk only' and really pull back on the services that we provide. "We don't have a male refuge at the moment but equally women's services are suffering as well."